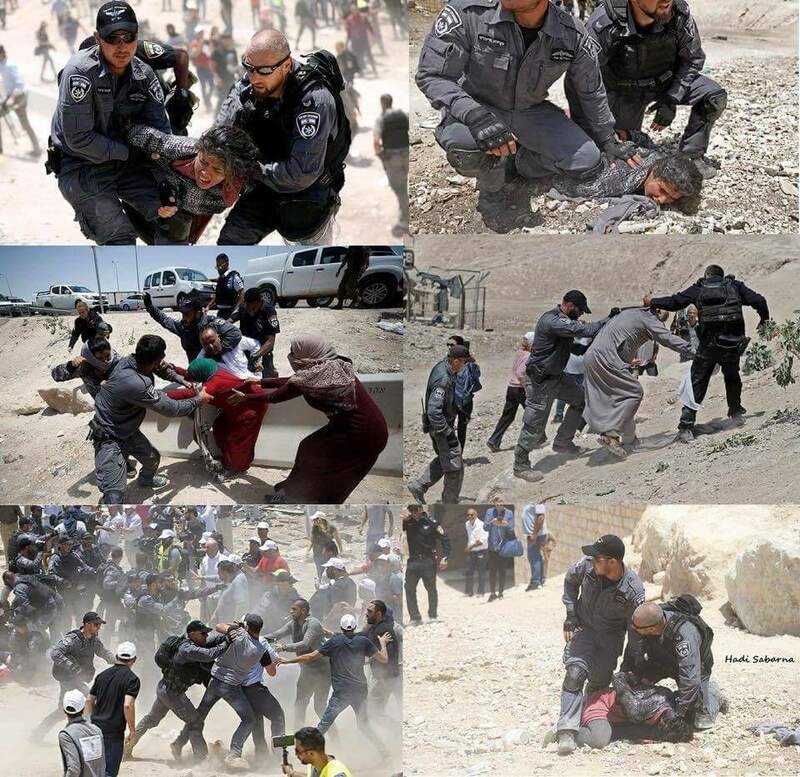 The community of Khan al-Ahmar, joined with human rights defenders, popular committees, and Palestinian officials thank all members of the international community, as well as international organizations, Diplomats from the U.N., the E.U. and many European governments, in their support and all attempts in helping stop the imminent threat of demolition. On July 4th, 2018 Israeli forces took actions to begin demolishing Khan al-Ahmar thereby forcibly displacing the Palestinian Bedouin community that lives there. On Wednesday morning, Israeli forces brutally cracked down on local residents and activists trying to protect the community, injuring 35, four of whom were hospitalized, and arresting 13 persons, including a the 19 year old woman Sara Abu Dahouk. This is the second time the community of Khan al-Ahmar has faced forcible displacement. In 1948, the Bedouin community sought refuge in Khan al-Ahmar after they forced out of their homes in Tal Erad. Israel’s targeting of the Palestinians such as the Bedouins in Khan al Ahmar, Al Araqib and Um Al Hiran in the Negev, draws a clear pattern of discrimination that knows no legal boundaries: they break from all international legal frameworks and apply both across the OPT and in Israel proper. The issue of Khan al-Ahmar illustrates the Israel’s objective of widespread and systematic forcible displacement of Palestinians and replacement with Israeli settlers, as part and parcel of Israel’s broader scheme of creeping annexation.Though various in from, these policies and practices share a common underlying force: the forcible transfer of Palestinians based on their ethnicity, under the semblance of legality. Through the implantation of the “E1” plan, Israel intends to demolish the community of Khan al-Ahmar so as to make way for the construction of more illegal settlement units. This serves the dual purpose of connecting the existing illegal Israeli settlements of “Kfar Adumim” and “Maale Adumim” with Jerusalem, and cutting East Jerusalem off from the rest of the West Bank. Despite these actions having been condemned by Palestinians and the international community alike, Khan al-Ahmar is still facing the dangers of being forcibly displaced and rendered homeless. More forceful action is needed to confront Israel’s relentless colonial machine. After the unlawful move of the US embassy to Jerusalem, Israel has been especially emboldened to take more severe measures against Palestinians living in vicinity of Jerusalem. We therefore call upon the international community, friends and comrades of Khan al-Ahmar, to take a clear stand and fast actions against this injustice of the violent and brutal displacement the Palestinian Bedouin community for a second time by Israel, the Occupying power. The wanton destruction of property and forcible displacement of civilians is prohibited under international humanitarian law, violates the most basic of human rights guarantees, and is considered grave enough to be criminalized under the Rome Statute. It is time to stand against these policies as emblems of grave human rights violations. Guided by the compass of justice and human rights, the international community should hold Israel accountable for its crimes against the displacement of Palestinians and the gross violation of the Palestinian Bedouin community of Khan al-Ahmar.